Save time and energy! Cook moist and fluffy potatoes in the microwave in a fraction of the time it takes to bake in the oven. Just wash the potato, do NOT prick with a fork, wrap it in a paper towel and place the bag in the microwave. Good for cooking sweet potatoes, yams, corn on the cob. Also great for warming tortillas and bread. Cooking instructions are provided with the bag. Our bag measures approximately 8 ½ x 8 ½ inches and will hold 3-4 medium potatoes or 2 large potatoes. The closure overlaps like a sandwich bag. 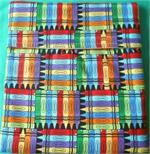 We use 100% cotton fabric and a lining that is made specifically for this purpose.